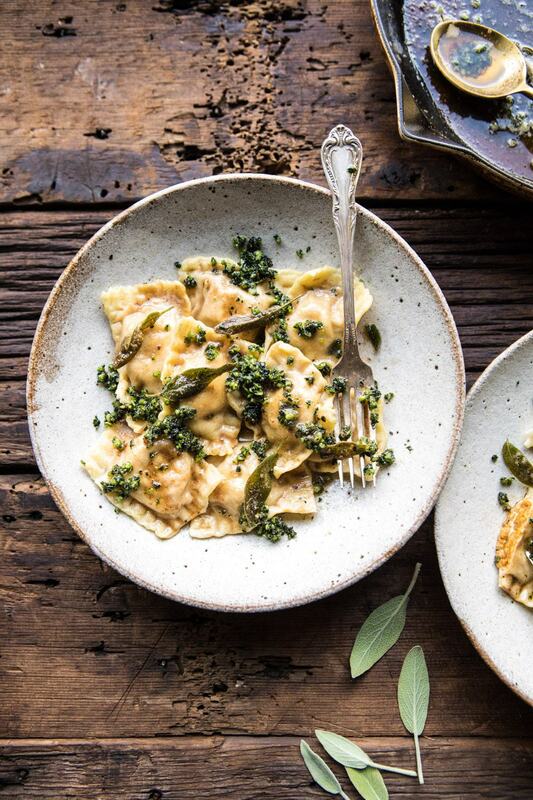 Mondays are made better with this Butternut Squash Cheese Ravioli. 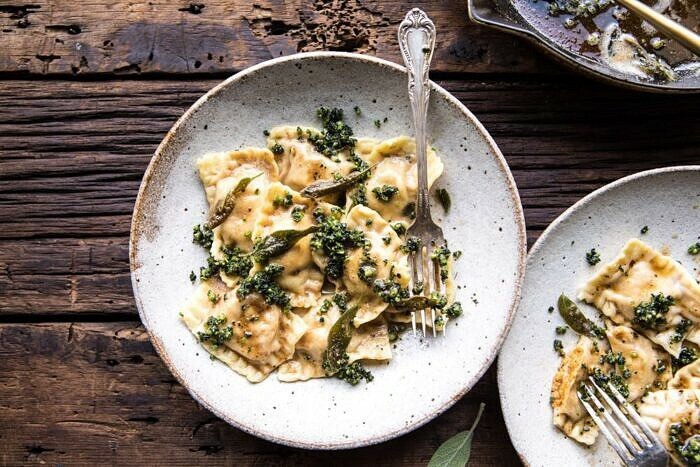 Fresh pasta dough (or wonton wrappers) filled with pureed roasted butternut squash, 3 cheeses, and served with a delicious, nutty browned butter sage pesto that’s sure to become your new favorite pesto for all of your cozy autumn and winter dishes. 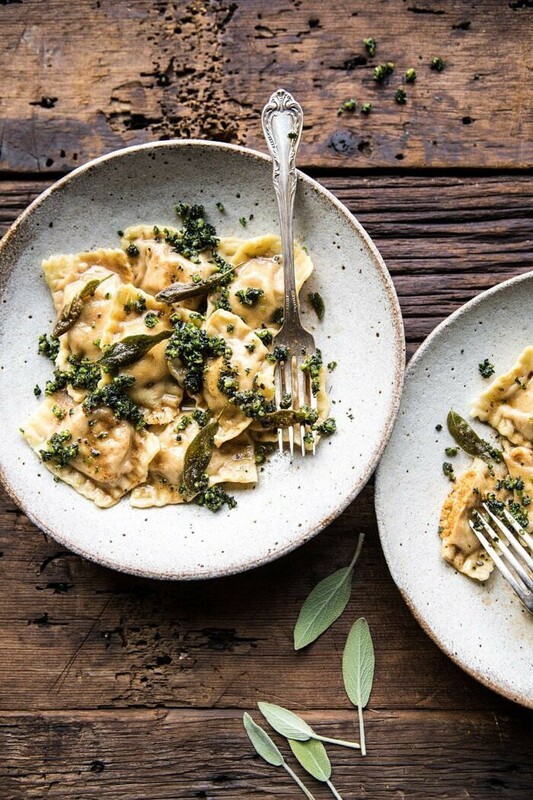 If there was ever a recipe that screamed autumn, it’s this butternut squash ravioli. Roasted butternut squash, browned butter, fresh sage? Yes, it’s all the flavors of autumn and it’s just as delicious as it sounds. 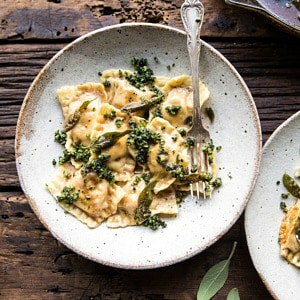 This ravioli is hands down one of my favorite recipes of the month. I know it’s not a 30 minute dinner, but trust me, the extra time spent in the kitchen is well worth it. You will realize that as soon as you start smelling the squash roasting in the oven and the sage butter browning on the stove-top. 100% percent worth every extra minute spent in the kitchen. 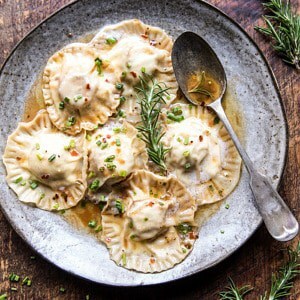 You guys know that I am all about a good 30 minute dinner, instant pot recipe, or slow cooked chili, but there’s always time for a recipe like this ravioli. It’s one of those recipes that’s so much fun to make while sipping your favorite cocktail, hanging with someone you love, and just taking a night to chill and unwind while cooking up something delicious. Everyone is busy, but no matter how much you have going on, some nights just need to be spent in the kitchen creating a dish that you’re going to love. This ravioli should be that dish. It’s warm, cozy, cheesy, buttery, filled with creamy butternut squash, and most likely the best recipe you’ll enjoy all week. Homemade ravioli has been something that I’ve love making since the very early days of Half Baked Harvest. 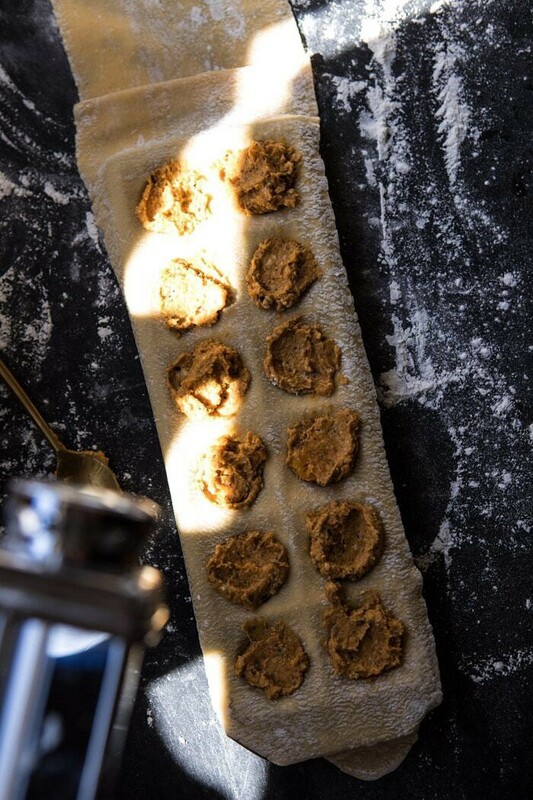 And like clockwork every time the weather turns cold, and the days become shorter and shorter, I’m inspired to create a new ravioli recipe. This year’s ravioli is quite possibly the best one I’ve created to date. It has simple but delicious flavors, with cozy fall written all over it in big bold letters. To start, I did make homemade pasta dough, but don’t stress, you do not have to make pasta dough. You can one, buy fresh pasta dough from your local grocery store. My Whole Foods store carries fresh lasagna sheets already rolled out. These work perfectly for making ravioli. If your local store doesn’t sell fresh pasta, no worries, you can use wonton wrappers like I did with this mushroom ravioli. Either option is great, whether it’s homemade dough, store-bought dough, or wonton wrappers. Use what works best for you. Next step is the filling. I kept things simple…ish and roasted up some butternut squash with just a little olive oil, salt, and pepper. I then pureed it with fresh ricotta, gorgonzola, and parmesan cheeses. It’s sweet, creamy, and has just a little bit of a bite from the gorgonzola. If you’re a no way on blue cheese kind of person, you can use crumbled goat cheese or whatever your personal favorite cheese is in place of the gorgonzola. Assemble the ravioli and then boil them off. This is my favorite pasta roller and my very favorite ravioli mold. I’ve tried a lot of different pasta rollers and ravioli molds, but these are the ones I use over and over again. While the ravioli is cooking, make the pesto. It’s really more of a sauce than a pesto…kind of like an extra saucy pesto actually. Brown some butter with some fresh sage (SO GOOD). Add toasted pumpkin seeds, kale (for bright color and body, you don’t really taste it much), parmesan and just a little olive oil. Season and done. I kept things simple so that the browned butter and sage could really stand out. 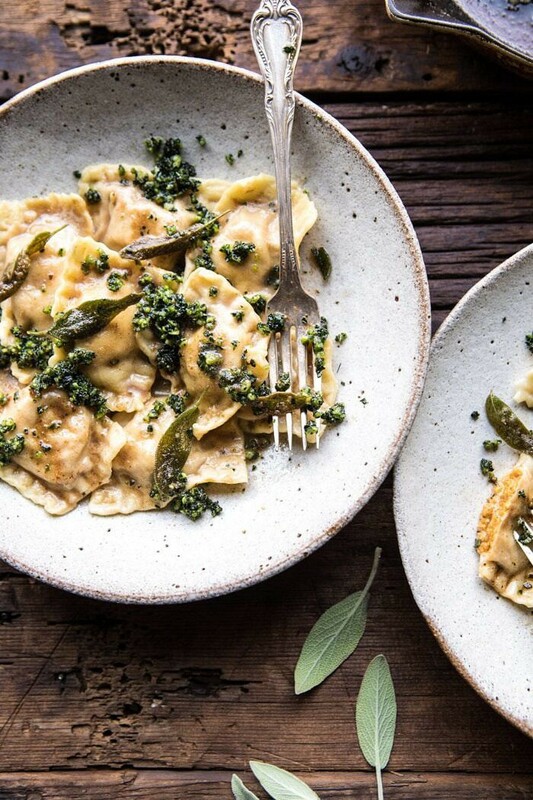 Toss the ravioli with the pesto and you now have most perfect plate of autumn ravioli. Monday night could not get better. Make this ravioli. Trust me, it will not disappoint. It’s the perfect fall dinner for a special night cozied up inside. 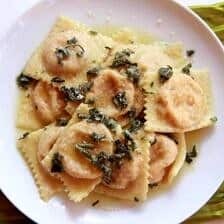 If you make this butternut squash ravioli please be sure to leave a comment and/or give this recipe a rating! Above all, I love to hear from you guys and always do my best to respond to each and every comment. And of course, if you do make this recipe, don’t forget to also tag me on Instagram! Looking through the photos of recipes you all have made is my favorite! 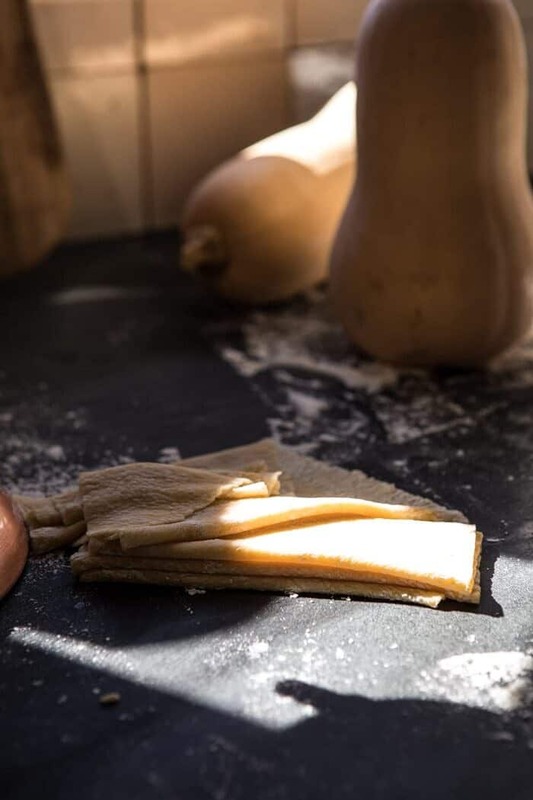 Fresh pasta dough (or wonton wrappers) filled with pureed roasted butternut squash, 3 cheeses, and served with a delicious pesto that's sure to become a favorite for all of your cozy autumn and winter dishes. 1. To make the ravioli. Preheat oven to 400 degrees F. On a baking sheet, toss together the butternut squash, olive oil, and a pinch each of salt and pepper. Transfer to the oven and roast for 25-30 minutes or until the squash is tender. 2. Transfer the squash to a food processor and add the ricotta, gorgonzola, parmesan, and honey. Puree until smooth. Season with salt and pepper. 3. Roll your pasta dough into lasagna sheets. Place 1 tablespoon of filling one inch apart over half the pasta sheet. Brush around the filling with water to moisten and then fold the sheet over the fillings, pressing down to seal. Cut into squares. Be sure to keep the ravioli covered as you work to prevent them from drying out. Repeat with remaining dough and filling. Alternately, you can make the ravioli in a ravioli press, or use this wonton wrapper method. 4. To make the pesto. In a large skillet, brown the butter over medium heat, stirring often until the butter is golden and toasted. Add the sage and cook another minute. Remove from heat, add the olive oil, kale, pumpkin seeds, parmesan, and season to taste with salt and crushed red pepper flakes. 5. Bring a large pot of salted water to a boil. Boil the ravioli in batches about 1-2 minutes or until they float. Drain. 7. Divide the ravioli among bowls and spoon the pesto over top. EAT and ENJOY! hmmm I wish I was having this for lunch!! I am glad you like this! Thanks Ruth! 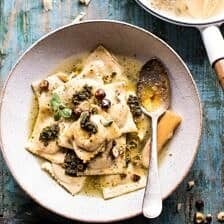 Ravioli is my ultimate fave pasta dish – love the look of this one – so Autumnal! I’d like to make this this weekend so I have unlimited time. So your recipe for the pasta dough is pumpkin? 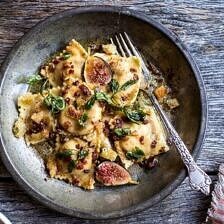 That’s what you recommend for this recipe, the pumpkin pasta dough?? Just want to double check before I invest hours and wasn’t supposed to do pumpkin pasta dough with butternut squash! Thanks, Tieghan! 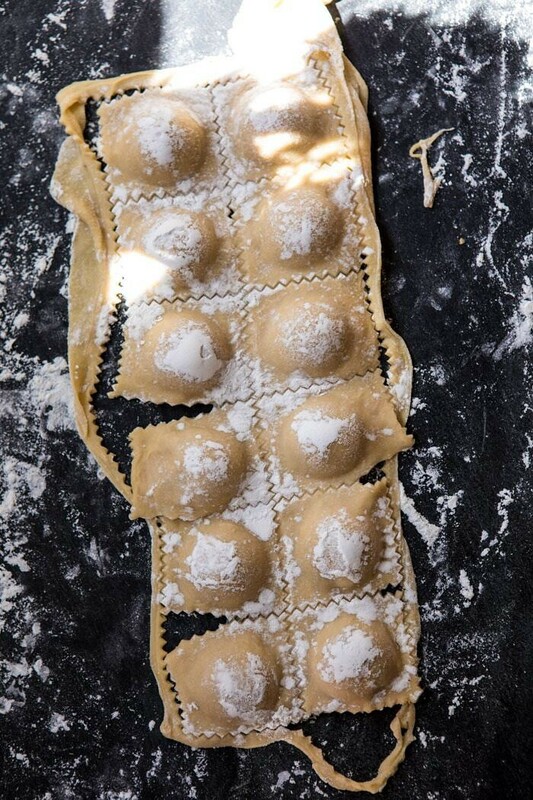 Homemade pasta is the absolute best and this ravioli looks perfect!! What is Tuscan kale? I live in Canada so can can I just use regular Kale or spinach? Do you blend the pesto once everything is combined in the skillet or do you leave it as is? I made the pumpkin pretzels with chipotle queso this past weekend and I think this recipe would be a good one for next weekend! Your recipes are always the best. Thanks! I had not made ravioli in years and this recipe looked too good to pass up. Absolutely delicious! Ravioli is the perfect dish to make when the days are getting shorter, more time to spend in the kitchen! I didn’t make the pasta..I cheated and used TJ’s b’nut squash ravioli because I had it and needed to use it…BUT I did make the pesto. Nice and light. I will make the ravioli some day and make this recipe again. Am sure your’s is much more flavorful than TJ’s Enjoyed the pesto!! Tieghan comes thru!